Gun Control Law Passed: Pittsburgh Restricts Use Of Assault-Style Weapons The mayor signed a set of gun control bills that were introduced after the deadly shooting at the Tree of Life synagogue last October. Supporters faced immediate opposition from gun rights advocates. 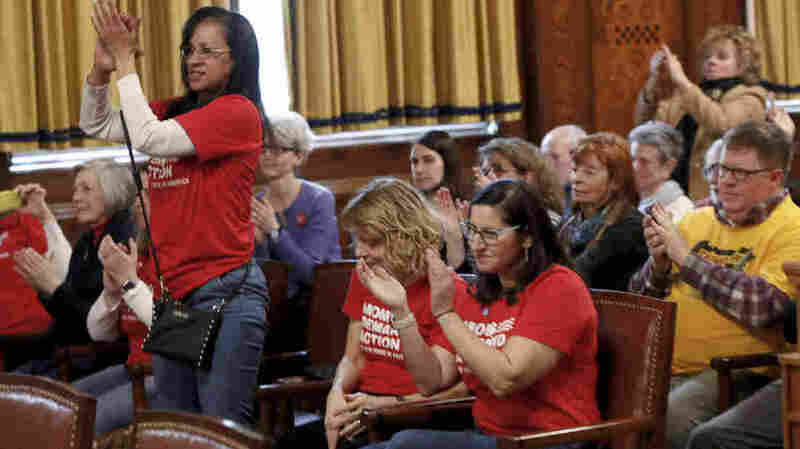 Supporters applaud after the Pittsburgh City Council voted to pass gun control legislation on April 2. Pittsburgh tried to regulate assault-style rifles over 20 years ago. But the courts have rejected those laws. State judges ruled that gun laws can be regulated only in the state's capital. Mayor Bill Peduto has said it is time for the city to do something about the city's gun laws. "If we didn't challenge laws, women wouldn't be able to vote," Peduto said after the signing. City officials originally sought an outright ban on assault-style rifles and ammunition and accessories. But the resistance was almost immediate. In January outside Pittsburgh's city hall, hundreds of protesters chanted, "We will not comply." Many were strapped with the weapons that would be banned by the law. The protesters say the gun laws aren't legal. Gun rights activist Justin Dillon, who organized that rally, says laws like this are a political stunt. "If a politician really cared about its people," he said, "they would have done something before the synagogue shooting and not waited for a tragedy to happen." Elected officials agree only the state can regulate firearm possession. So in March they came up with a new strategy: banning the use, not the ownership, of the guns. City Councilman Corey O'Connor introduced the bill and its amendments. "I think they're on the run and this is the first time that more and more, not just cities, but elected officials and communities are starting to fight back," he said. But the new law offers a broad definition of use. It bans not just firing the gun, but even having it loaded in public. That means many of the protesters who opposed the law at the January rally would have been breaking it. Dillon admits his gun was loaded. "It's kind of pointless not to have a gun that's loaded," he said. The NRA has filed a lawsuit sharing the same complaints as the protesters. A representative was unavailable for comment, but in a statement the group said, "Pittsburgh residents have a right to carry the self-defense tools that best suit their needs." Peduto says that to have new gun laws, the city will have to go to court. "The only way that a society progresses is by challenging what is accepted during their time," he said. Not every local official supports the legislation. Three of the council's nine members voted against it. And in January, District Attorney Stephen Zappala told the city council it does not have the power to regulate guns. The city's law will go into effect in 60 days if a judge allows it to pass.